When you look in the mirror up close what do you see? Is your skin tired looking? Over time, collagen levels in your skin can drop, making the skin sag and wrinkle. It is important to take care of your skin morning and night. The environment plays a pivotal role in the overall health of the most exposed skin, your face. As with any other health regime, in order to keep healthy supple skin one must maintain, and that takes diligence. There are products galore on the market for your face. In this day and time it is imperative to make an educated choice on what you apply to your skin. Ingredients need to be tested and true for what they can do. Facial skin is fragile, and excessive application of chemicals of untested products can wreak havoc, if not actually do damage to your face. 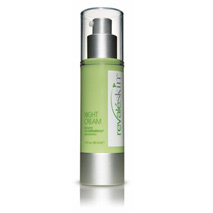 Revale Night Cream is only one of a line of products that is tested to be true to its claims. The Revale line of skin products has the proof from clinical testing to back their claims. Revale Night Cream is a great way to end the day. The combination of the Coffee Berry ingredient is clinically proven to revitalize and rejuvenate your skin while you sleep. Wake up to skin that is softer and more supple, because you took the time and effort to treat your skin right. The formulation of natural antioxidant extracts are the key ingredients that can help protect and restore facial skin from the harsh environments you face daily. The benefits one receives from Revale Night Cream will have friends asking what changes you have made in your skin care regime. Skin is rejuvenated from the daily exposure to free radicals. Free radicals cause collagen to breakdown and skin begins to look older before its time. The Revale skin care line protects facial skin from environmental damage, as well as wind, sun and harsh temperatures. Fine lines and wrinkles that cause premature aging are diminished with the use of Revale. Watch the signs of aging as they are reversed. Sensitive skin is safe with Revale as it is gentle. Pores will not get clogged nor will they expand, but look smaller and refined. The products are all allergy-tested for gentle formulation. You will never feel like your face is covered in a thick cream. Revale products are quickly and evenly absorbed, making your face fresh and ready to take on the world. There are no residues to inhibit your use of other cosmetics. Many people today are sensitive to heavy or strong fragrance. Revale has a very mild, pleasant scent, derived from the natural ingredients. The tests have been done and the product is of the best quality available. In a time where the people of the world are concerned with the ingredients of everything that goes on or in our bodies, Revale skin care products pass the test. You need and deserve to take care of your skin. Reveal the beauty from within with ReveleSkin Night Cream. For a closer look at RevaleSkin Night Cream, and the complete line of RevaleSkin products, click here. Skincare Solutions Store has a amazing selection of quality skincare products that will help your skin stay young and healthy looking.